Americans for Responsible Leadership (ARL) is an Arizona-based 501(c )(4) organization. In October 2012, the non-profit contributed $11 million to the Small Business Action Committee (SBAC) PAC based in California. The contribution resulted in an investigation of the group by the California Fair Political Practices Commission, alleging that the ARL failed to comply with the state's disclosure laws. The Fair Political Practices Commission filed suit against ARL in the Sacramento County Superior Court in October 2012. The primary goal of the lawsuit was to uncover the donors behind ARL who contributed towards the $11 million given to SBAC that year, a sum spent mainly on ads opposing two ballot initiatives. The ARL made an $11 million donation to the Small Business Action Committee PAC in California, which spent those funds to oppose Proposition 30 (which would raise taxes) and Proposition 32 (which would prohibit labor unions from raising money for political activities through employees' voluntary payroll deductions). California's elections board did not buy ARL's claim that its donors had given $11 million for reasons other than funding ads to influence these ballot issues and demanded it reveal its funders. 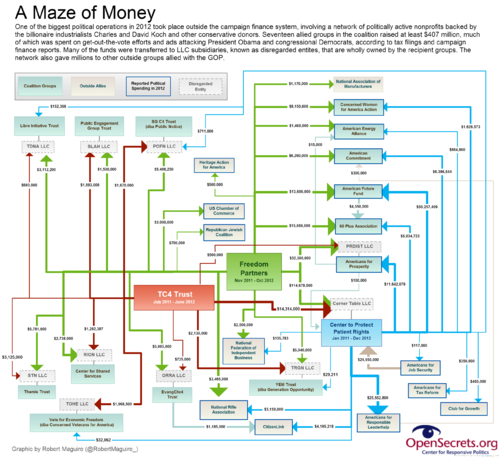 After initial resistance, ARL revealed that it had received $11 million in contributions for the purpose of funding ballot initiatives from another dark money nonprofit, Americans for Job Security (AJS), a group that received its funding from Center to Protect Patient Rights, another Arizona non-profit linked to the Koch Brothers. Arizona Sales Tax Renewal Amendment, Proposition 204 (2012): $925,000 donation to the the campaign against Prop. 204. ↑ 2.0 2.1 Ian Lovett, "California: Lawsuit Seeks Name of Political Donors", October 25, 2012. ↑ 3.0 3.1 "Calif. Suit targets anti-initiative group", Arizona Daily Star, October 26, 2012. ↑ Chris Megerian and Patrick McGreevy "Disclosure by Arizona nonprofit shows ties to Koch brothers", LA Times Blog, November 5th, 2012. ↑ Ian Lovett, "California: Lawsuit Seeks Name of Political Donors", October 25, 2012. ↑ Brendan Fischer, "California Elections Board Peels Back Layer of Dark Money Onion, Finds More Onion", "PR Watch", November 6, 2012. ↑ 8.0 8.1 Yvonne Wingett Sanchez, Mary Jo Pitzl and Sean Holstege, "Arizona-based non-profit releases donor names", AZCentral.com, November 5, 2012. This page was last edited on 11 October 2017, at 18:57.